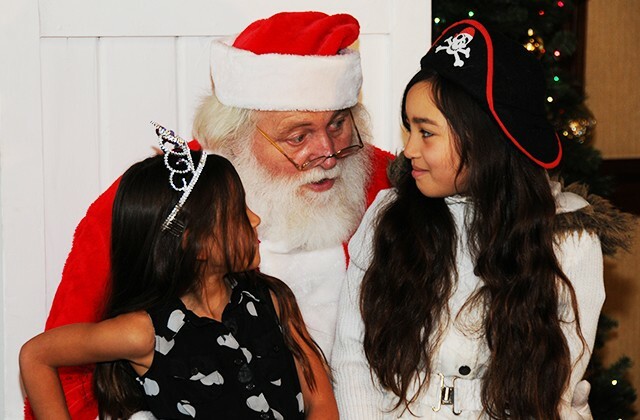 The Landing hosted its annual Breakfast with Santa Dec. 13 where families came from all over the surrounding communities to enjoy a meal their children wouldn't soon forget. "It's always a great opportunity to get to bring the children to see Santa before Christmas," said Elisa King, civilian, who brought her family from Ozark. "Seeing and talking to Santa always gets my children in a good mood and ready for the season. I'm so grateful that Fort Rucker has an opportunity for something like this. "It always brings us closer together and it gives us a chance to do something as a family, which is nice," she continued. "Every year I make it a point to take them to see Santa because it really lights up their eyes. It just isn't Christmas without it." "I love to cook for my family, but there are times I'd rather be just enjoying sitting down with my family and having a meal together," said Jessica Johnson, military spouse. "Especially a spread like this one with all the different choices. This would be a lot to clean up afterward, so why not let someone else do the cleanup while I spend the time with my family." "These are such important memories that we're making together," she said. "The older you get, you really start to lose that Christmas spirit when the season comes around. This is my favorite time of year, and if I can do anything to maintain that feeling for them as long as possible, I will." And that's music to the ears of Janice Erdlitz, Directorate of Family, Morale, Welfare and Recreation. "It's all about making memories," she said. "(I feel) that's what we do best at Family and MWR -- we make the opportunities happen to help families make memories together that will last a lifetime."